Arterial thrombi are also called white thrombi. Sites Of Mural Thrombosis: Capacious chambers of heart, Aorta, Aneurysms. 2. Occlusive Thrombus: It refers to a thrombus that completely occludes the lumen of small arteries. Common sites of occlusive thrombosis are; coronary arteries, Femoral Arteries, Cerebral arteries, iliac arteries, popliteal arteries, Mesenteric arteries etc. 3. Vegetations: They refers to the thrombi deposited on the heart valves. vegetations are found in bacterial infective endocarditis, non-bacterial thrombotic endocarditis and in autoimmune diseases. 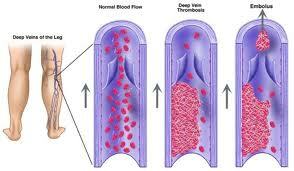 Venous thrombi are also called red thrombi or phlebothrombosis. It is usually occlusive. They have the following characteristics. They are rich in RBCs and therefore, are called red, coagulative or stasis thrombi. On transaction, lamination is not well marked. but tangled strands of fibrin are seen. Venous Thrombi create a long snake-like cast of the lumen of the vein, the tail of which extends in the direction of the blood flow that is toward the heart. Almost 90 % of all venous thrombi develop in deep veins of the lower limb, that is femoral, popliteal and iliac veins. less commonly venous thrombi develop in peri-prostatic plexus or ovarian and peri-uterine veins.